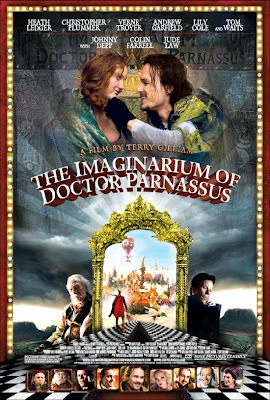 Blu-Ray Review: "The Imaginarium of Dr. Parnassus"
"The Imaginarium of Doctor Parnassus" centers around the title character (Christopher Plummer) and his band of carnies that go from town to town setting up their side show. Truth be told, the side show is just a cover for a Battle of Souls between Dr. Parnassus and Satan. The two have made a bet (or a series of bets), the wager being the soul of Valentina (Lily Cole), Parnassus' daughter. With the end of the bet at hand, the group comes across Tony (Heath Ledger), a young man on the brink of death who has the gift of persuasion. Before long business is booming but the group begins to question Tony's motives. The deadline with the Devil draws near, however, which sets off a chain of events that pit Parnassus, Tony, and Satan against each other in a final showdown. Let's just get this out of the way up front: "Parnassus" is a freaking weird film. It is NOT for everyone. I myself ignored it for a while, assuming it wasn't for me. Terry Gilliam is one of the best, most gifted directors in the industry and I really mean that. Very few people can take a vision to the screen the way he does. With that said, however, his films are SUPER weird. And if you haven't seen a Gilliam movie then you can't understand what I mean. He has a style completely all his own and more often than not, it's too weird even for my slightly strange tastes. So take my statement of this not being for everyone seriously when considering the next paragraph. "Parnassus" is a magnificent film. Gilliam's script is inspired and pulls some original content from a story that's been told a number of times. The visuals are outlandish, of course, but fantastic and work with the story as opposed to overshadowing it. The performances, however, are the bread and butter here, especially those of Plummer, Ledger, and Tom Waits. Question: is Christopher Plummer the most underrated actor of our time? Answer: Yes, yes he is. The guy brings the noise to every single role. Dr. Parnassus is a doubtful, broken, and desperate man, yet good to his very core, and Plummer brings all of that and more. Likewise, Ledger shows some serious talent in what was to be his final performance. Waits is the equal, if not the superior, to them both, however. His version of Satan is smooth, debonair, and terrifyingly appealing. Waits steals every scene he's in and that's a serious compliment given who he's stacked up against. In addition to all of this, the finishing of the film is a stroke of genius. As you may or may not know, Ledger died in the middle of production. Rather than starting over or scraping the project entirely, Gilliam cast Johnny Depp, Jude Law, and Colin Ferrell in Ledger's place. Gilliam weaves these faces and the changes into his story, making it a plot point within the movie rather than asking us to simply suspend reality and ignore the change in appearance given the circumstance. A masterful finishing touch in my opinion. In the end, "Parnassus" is that rare film that grows on you. While watching I thought it was solid, a day later I described it as very good, and now, a week or so removed, I feel it borders on great. A truly, truly special film.